Getting To Know You Silhouette Version 3 class has begun! Not only is it a freshly updated class, but the classroom has a fresh new look. Goin’ clean and simple and trying to streamline. Today is the last day to get this on sale! You can find it in the Store. 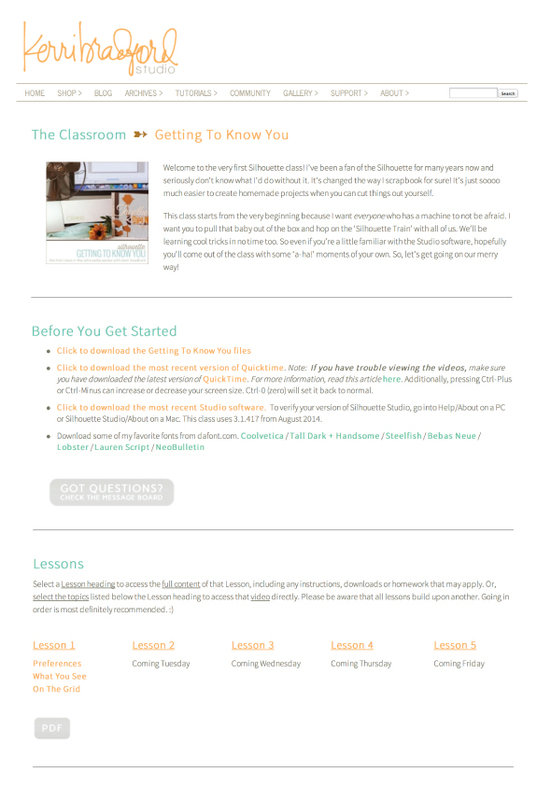 If you purchased the class over the past 2 1/2 years–including from JessicaSprague.com–you have access to this update. The classes will be available on Jessica’s site some time after this week. And now, if you aren’t the Studio Calico Color Theory winner below, never fear, because I have got some savings just for KBS fans! And now, let’s pick some winners! Thank you to all the fantastic companies and friends that made last week so wonderful. I loved reading all your comments and the giveaways we had were just so amazing. So blessed to be in this industry surrounded by great, great people. Where do I find the price of the class? I couldn’t find the price on Jessica blog.Thanks for your help. Thanks for all the Birthday Week surprises! It was really fun to check in everyday and see what you had up your sleeve. Congratulations to the winners! Thanks Kerri for all the inspiration I get from you and your website every day! Hope you had a GREAT birthday! You noted that if previously purchased on Jessica Sprague’s site it would be available in about a week. How will I be able to tell its the updated version? Will there be some sort of notation in the description or a whole new link? Hmm. I’m not sure on that one yet. Kerri I can’t thank you enough for your generous spirit & excellent teaching skills! I have completed both Getting to know you (old version but staring over with new ;)) and the 2nd one places you’ll go! I have purchased the 3rd & 4th ones as well and enjoy every single minuet in your class! And now I won a prize?!!? What ?!?! how did that happen ?!?! Thank you & Many Blessings! Hi Kerri. Is the update up on Jessica’s site yet? What do we need to look for please.